Replacing a front door to a home is a popular home remodeling project in recent years. Why? Because it offers great curb appeal and even better return on your investment. There are some important material considerations for maximizing the cost-value and ROI. And of course, an entry door may include more than just the front of your home. When it comes to replacing your windows, wood is the more expensive material, but not so with doors. 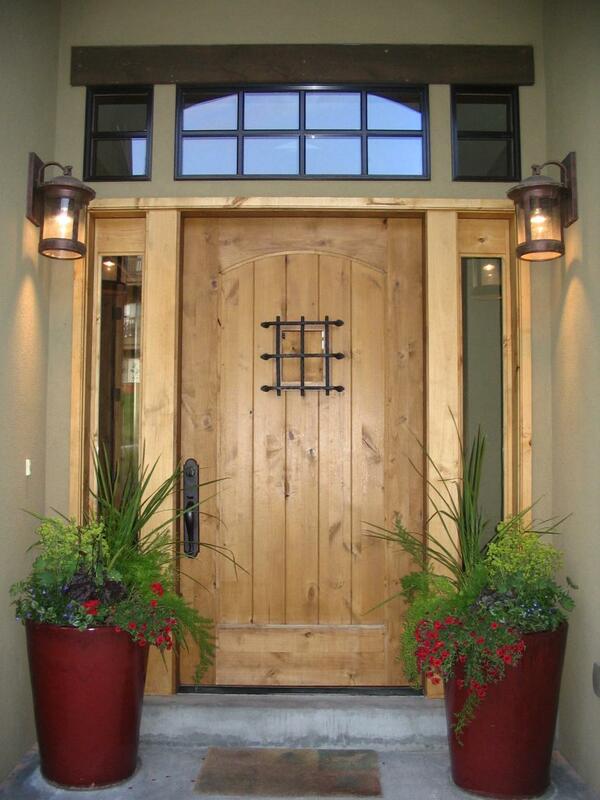 There are primarily three material types for main entry doors: wood, steel and fiberglass. Aluminum, vinyl and glass doors are less popular for main entrances, yet for storm doors and sliding doors they tend to be the most cost effective options. Door installation can be a DIY project, though that depends a bit on the project and the door type. What generally takes the average homeowner five to seven hours to install takes a crew of two experienced contractors less than 2 hours to install. For a single, steel front entrance door, the average cost ranges from $500 to $1,250 installed. Wood jumps up on the low end to $850, but on average it ranges $850 to $1,250 installed. Fiberglass costs about $750 to $1,500 on average for installation. You’ll certainly see prices much higher than this, for doors alone. While also seeing prices for doors that are under $500, but the above information assumes middle of the road on door quality and about 2 hours of time for a quality contractor to do the work. Breaking down the costs for a door is relatively simple. Though that depends on what the project entails. For door replacement, it means installing a new door, along with it’s supplied hinges, weather strip, and threshold into an existing frame. All that is the cost of the door. Lock sets vary in cost and design. Going the DIY approach means selecting from hundreds of options. The purpose is two-fold, to maximize security and to complement the door design. On the low end, plan to spend $65 to $175 for a basic lock set for each door. Somewhere in the mid range are electronic locks with keypad entry. These range from $85 to about $225 on average. The high end is $200 to $400, which usually includes handles, bolts and possibly more technological features. When hiring a professional contractor, choices may be limited to what they offer, but prices for the door usually include the lock set or options to upgrade that at an additional cost. Their labor rates often include the time it takes to install the locks and handles, thus adding nothing really to the overall quoted price. Sliding doors can be quite a bit more expensive. Usually, a professional crew needs at least 4 hours, and up to 8 hours for such a project. The doors themselves range from $800 to $1,500 and can go much higher depending on desired width. The overall project costs here range from $1,300 to $3,500. Similar to sliding doors are double entry doors. While these are hinged similar to a traditional exterior door, they tend to cost far more given their ornamental designs and majestic appeal. The doors along range from $1,000 to $3,000, or more and the labor time is likely in the 4 to 8 hour range, meaning overall project cost is $1,500 to $4,000. Storm doors are on the other end, are the least expensive, both to purchase and install. A wood storm door could cost as much as $700, but typically homeowners go with aluminum or vinyl to not just save on costs but ongoing maintenance. Spending $300 for fully installed vinyl storm door is what you can expect. As you can see from above, the biggest factor is the type of door and lock set that you want to spend your money on. Obviously, in the case of replacing a door, it must match the frame. It’s also important to have a door match your home. Fortunately, the standard entry doors, even while offering much variation, tend to fit most homes in terms of style. How ambitious you want to get with a door is what will influence the cost the most. Adding sidelights to a main entrance is highly appealing, magnifying curb appeal. But the costs go up at least $2,000 or on average $3,250 for this type of addition. Similarly, adding a transom makes for a more majestic main entrance, but adds to the cost. With all the material types, there is the basic grade, or economic version that allows you do have decent quality of that material at the most affordable price currently on the market. Wood, steel and fiberglass all have economical options. And all of them have options that enhance security or emphasize ornamental features in the material, plus add designer glass. These can greatly enhance curb appeal, but also bump prices up well over the average costs. Then there is the labor costs and potential repairs or added charges. Essentially, for a simple replacement, the costs for labor ought to be minimal. Yet, if the frame has rotted wood or otherwise in need of some repair, this wouldn’t be known until the existing door is removed. Once the wood lining the frame is removed, it can open up potential issues that are best repaired at time of a door replacement. Having said that, it is very important to get multiple quotes from contractors. You’ll learn about the many options that professionals assess as best door and lock options for your home. Plus you’ll be able to find out information, from at least some of them, what rates may be for potential repairs. It’s important to learn that before the work starts. Plus, you’ll want to have warranty information on the product and services they provide. Here we explain the pros, cons and chief reason for going with a Entry Door replacement. The Good: The market for today’s doors offers greater security, extensive options, and affordability. Plus an upgraded entry door is sure to improve on energy efficiency for your home. The Bad: Lack of planning and/or improper installation can lead to problems that a non-professional can’t handle or, worse, that a homeowner can’t afford. A door frame can only fit so much, and so if wanting to be ambitious, with add-ons, this takes careful planning well before the existing door is removed. Plus, if there are repairs needed to the frame, the inexperienced will struggle with these repairs that professionals can address with efficiency. With proper installation by a qualified contractor, there really isn’t any cons, at least none that outweigh the next item. The Oh So Pretty: Curb appeal usually means high joy factor for the homeowner which an upgraded door usually delivers on. But that’s not the chief reason. The ROI for an entry door continues to be among the highest for all home remodeling projects. The 2018 Cost vs. Value Report shows replacing an entry door has an ROI of near 91%.